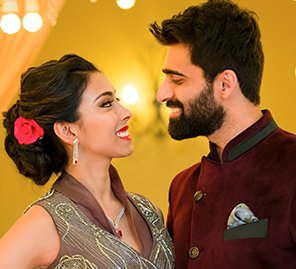 Traditional color palettes, an on-trend wedding outfit and with a subtle luxury throughout, Smily and Abhishek’s wedding was a royal affair. 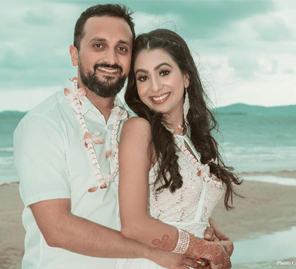 When they first met through a mutual friend, Smily and Abheshek had no idea one day they’d be married. 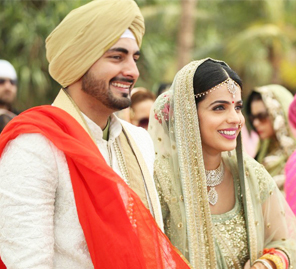 Years later, they exchanged vows at The Oberoi Sukhvilas Resort & Spa in Chandigarh. Here, we share all the details from their big day. “I was on holiday from my engineering college in Patiala, visiting a friend in Chandigarh,” Abheshek remembers. There was an instant connection with Smily but another friend was interested in Abheshek. Eventually, as he lost touch with the common friend, his friendship with Smily grew. The elegant haldi décor, customized to the couple’s taste, featured a traditional palette of orange and yellow florals. The mehndi had a retro theme with a focus on bright colors and quirky décor elements. Lots of flowers and fun bric-a-brac further enhanced the pop vibe. Festive and colorful, the venue looked like a carnival! 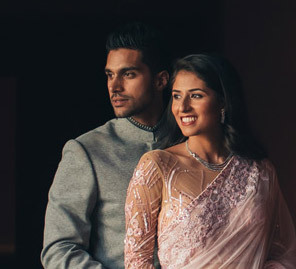 The couple wanted an evening of subtle elegance with a big dose of glamor! So the décor included rich drapes and warm lighting with plays of light and sparkles thrown in. A stage built especially for the evening hosted a series of performers and the night was a grand success. An al-fresco wedding suggested a venue covered in fresh flowers for a wonderfully romantic atmosphere. At sunset, the beautifully decorated mandap was the perfect place for the serene nuptial rituals. With traditional colors, gold and red prevailing across the décor, the bride was on trend in a powder pink ensemble, a matching dupatta over her head and wearing stunning jewellery. Abheshek looked like a young prince in his contrasting outfit. After the sophisticated ceremony, as evening fell, the couple, surrounded by their closest family and friends, walked into the next chapter of their lives.